In a first in the brand's history, the celebrated Scotch blend will be bottled and marketed on non-Scottish shores. David Pattison, Siddharth Banerji, Glen Gribbon and Pushpanjali Banerji at the press meet in Taj Mahal Hotel, Delhi, on August 28. If you thought India's already brimming with premium whisky brands vying to satisfy your taste for the exquisite, here's some more good news that will make your cup brim over. Kyndal Group, India's leading Alcobev Company in the premium spirits segment, and Edrington, Scotland's premier producer and distributor of global spirits brands, have announced a 50:50 joint venture - dubbed the Edrington Kyndal India Pvt Ltd - to bottle, market and distribute Cutty Sark blended Scotch whisky in the Indian market. And this is one collaboration that is bound to go down in history, considering that it's the first time Cutty Sark will be bottled away from the heady shores of Scotland. Announcing the partnership at the Taj Mahal Hotel in Delhi on August 28 were Glen Gribbon, Director of Blends for Edrington; David Pattison, Edrington's Area Director for India; and Siddharth Banerji, Managing Director of Kyndal Group. This tie-up, they said, will establish a fully integrated supply chain for Cutty Sark in the Indian market. Banerji, for one, seemed extremely delighted at the developments involving the Scottish brand. "We are delighted to be associated with a brand like Cutty Sark, which has a great history and story behind it," he said. "Our JV with Edrington will bring this outstanding premium brand to the Indian shores." Describing the phenomenon that is Cutty Sark, Banerji added, "It is a blend of the best grain whisky and the finest malts in the world such as The Macallan and Highland Park. This blend will be imported in bulk from Scotland and Kyndal will use its best-in-class bottling facility at Gemini Distilleries in Goa to bottle, pack and market Cutty Sark. It will ensure that the Indian consumers get access to the original Cutty Sark in an exciting new pack." Glen Gribbon, Director of Blends for Edrington, said, "The market for Scotch whisky is growing internationally. 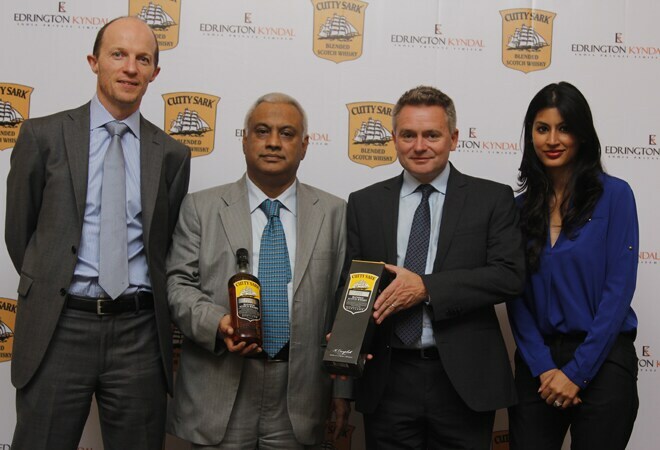 We believe that Edrington's expertise in premium spirits, combined with Kyndal's strong distribution, creates a great opportunity to make Cutty Sark more accessible to premium consumers in the dynamic and growing Indian market." When asked if recent reports of alcohol prohibition in Kerala will set off a national trend detrimental to the interests of alcohol brands, Banerji just replied smilingly that Oommen Chandy government's initiative may not be successful in the long run. Citing the example of prohibition-era America, he said that such a step will only increase cases of bootlegging and production of illegal liquor. Also, the administration is bound to realise that prohibiting liquor without creating a means of alternative income is hardly practical, as is the possibility that it could affect the state's flourishing tourism industry. Starting October, Cutty Sark will be available across retail outlets in the key markets of Goa, Delhi, Chandigarh, Rajasthan, Uttar Pradesh, West Bengal, Assam, Meghalaya, Tripura, Puducherry, Odisha, Telangana, Andhra Pradesh and Karnataka. Edrington will continue to bottle Cutty Sark in Scotland for all the other global markets.